Uncertainty shocks, here defined as changes in the size of the probability distribution of a forthcoming macroeconomic outcome (second moment shocks) are inherently unobservable. Therefore, their measurement has to rely on the use of observable proxies. Those most commonly used in the literature include: stock market and exchange rate implied volatilities, dispersion of survey-based forecasts for activity or company earnings, media search, household or corporate survey-based measures, and indices of macroeconomic surprises. While each measure has its own pros and cons, they all represent imperfect and partial ways of gauging developments in economic uncertainty. For example, proxies based on financial market volatility have the advantage of being timely and comparable across countries. However, they can move regardless of changes in uncertainty, including as a result of increasing risk aversion of economic agents. And while survey based measures provide a more direct link with the real economy; they might be affected by changes in the mean expectation of an economic outcome rather than by a change in the probability distribution. Despite these limitations, the measures cited above cover a reasonable cross-section of different types of uncertainty measures and economic sectors. Taken together, they can provide a useful steer on the degree of uncertainty in the economy. One method of aggregating them together is principal component (PC) analysis. Principal components are statistical combinations of individual data series in an aggregate date set which explain the variance among the individual series. A synthetic indicator of economic uncertainty for the euro-area constructed as principal component (PC) is shown in Chart 1. This is based on options-implied volatility of equity and the effective exchange rate, the spread of IBES analysts ‘earnings forecasts, euro-area consumer confidence balances from the European Commission and a measure of policy uncertainty from Nick Bloom. 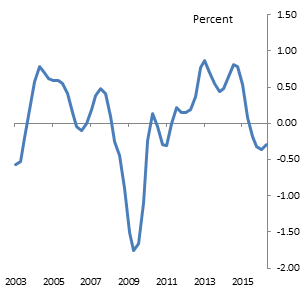 The euro-area PC indicator points to a marked increase in economic uncertainty during the financial crisis (Chart 1). The increase during the sovereign crisis also looks noticeable albeit of a lower magnitude. 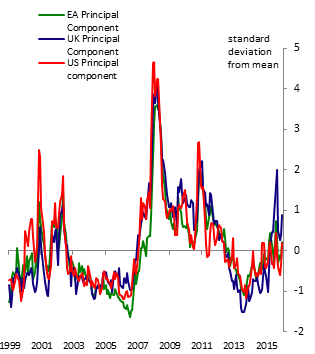 A look at the measures underpinning the principal component suggest that the sharper increase in the PC in the 2008-2009 period was accounted for by larger surges in measures of volatility, confidence and forecast dispersions (Chart 2). In contrast, policy uncertainty increased more during the sovereign crisis relative to the financial crisis. Following a period of low uncertainty the PC indicator picked up a little in the immediate aftermath of the UK referendum on the EU, accounted for by a sharp increase in policy uncertainty. But the increase unwound rapidly, suggesting the impact of the “Brexit” vote on euro-area activity through this channel has (so far) been limited. The euro-area PC appears to be highly correlated with similar measures constructed for the UK (blue line in Chart 1) and the US (red line in Chart 1). 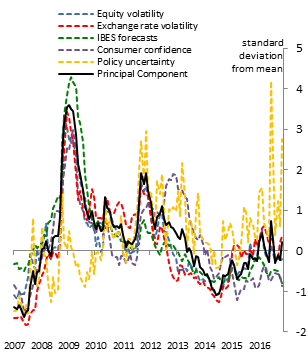 This suggests that global common factors have been important drivers of uncertainty in the three economies. But country specific factors might have also played a role in driving uncertainty. In order to gauge the importance of developments in macroeconomic uncertainty for euro-area activity we have estimated a structural VAR, similar to that estimated for the UK by Haddow et al. This approach allows a high degree of interconnectedness — or endogeneity — meaning that all the variables can, in principle, be affected by each other. The VAR includes the following variables: euro-area uncertainty (proxied by the EA principal component shown in Chart 1), a measure of credit spreads ―computed as the difference between a weighted average of interest rates facing euro-area households and corporates and the euro-area overnight interbank rate, the quarterly level of EA GDP, the seasonally adjusted level of the euro-area harmonised consumer prices index, the quarterly level of euro-area employment in hours worked ( the last three expressed in log deviations from a statistical trend), and the three month euro-area interbank rate. By imposing a simple identification structure to the data it is possible to distinguish pure uncertainty shocks from other shocks and trace their effect on activity. To do this we rely on a Cholesky identification scheme, where we assume the uncertainty indicator to have no contemporaneous influence from changes in the other variables. 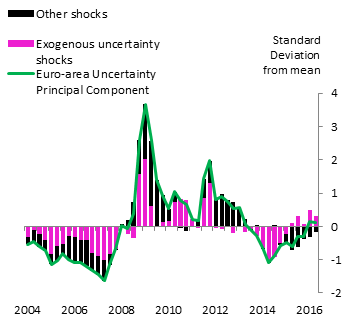 The model structure allows us to decompose past movements in the euro-area PC uncertainty indicator into those reflecting pure uncertainty shocks (pink bars in Chart 3) and other shocks (black bars). Movements in the uncertainty PC might be triggered by pure uncertainty shocks, but could also be an endogenous response to other factors including for example tighter credit conditions or external shocks. The decomposition suggests that around half of the rise in uncertainty during the financial crisis reflected a pure uncertainty shock, with the remainder was accounted for by other factors. Similarly, the early increase in the PC indicator during the sovereign crisis and the fall in the aftermath of it were accounted for by a combination of uncertainty and other shocks. In contrast, the most recent increase seems to have been largely accounted for by uncertainty shocks. A key difficulty with the identification approach used in our analysis is distinguishing uncertainty shocks from financial market shocks. That’s because, as stressed by Gilchrist, Sim and Zakrajsek (2013), these two shocks tend to be observationally equivalent with both leading to a rise in credit spreads. Our estimates appear to be robust to this critique. Changing the ordering of the variables in the estimation doesn’t seem to affect the results in a significant way. Our identification structure also allows us to estimate the impact of movements in uncertainty on activity. In particular, chart 4 shows the impact on GDP of a one standard deviation increase in uncertainty in one period that then unwinds according to the estimated model dynamics. 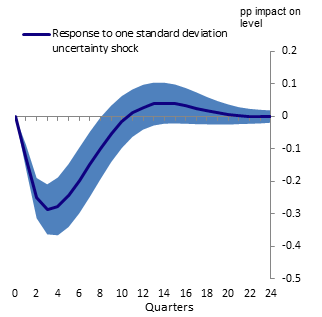 It suggests that a 1 standard deviation uncertainty shock has a peak impact on the level of GDP of -0.3 pp after 4 quarters. The estimates from the model imply that the shock unwinds rapidly, with half the rise in uncertainty unwinding within a year. Finally, we’ve produced estimates of the impact of past uncertainty shocks (pink bars) presented in Chart 3 on year-on-year euro-area GDP growth (Chart 5). We find that in the period between 2008Q3 and 2013Q3 elevated uncertainty subtracted (on average) around 0.5 pp from annual growth in the euro-area. As the shock unwound, GDP was boosted by a similar amount during the recovery. Uncertainty seems to be currently subtracting from euro-area GDP growth, which is consistent with a renewed rise from very low levels since mid-2015 (shown in chart 4). In this blog I argued that heighted economic uncertainty has been an important driver of euro-area GDP during the financial and sovereign crises. With elections approaching in a number of euro-area countries, uncertainty could increase further. Policy makers needs to watch this closely as any further rise could have a material impact on activity. Lucia Quaglietti works in the Bank’s International Surveillance Division. “…we assume the uncertainty indicator to have no contemporaneous influence from changes in the other variables.” This assumption sounds dubious. Moreover there is no discussion setting the recent trends in growth rate in the context of the long-term decline since 1970, or earlier, in the growth rate of EA GDP.